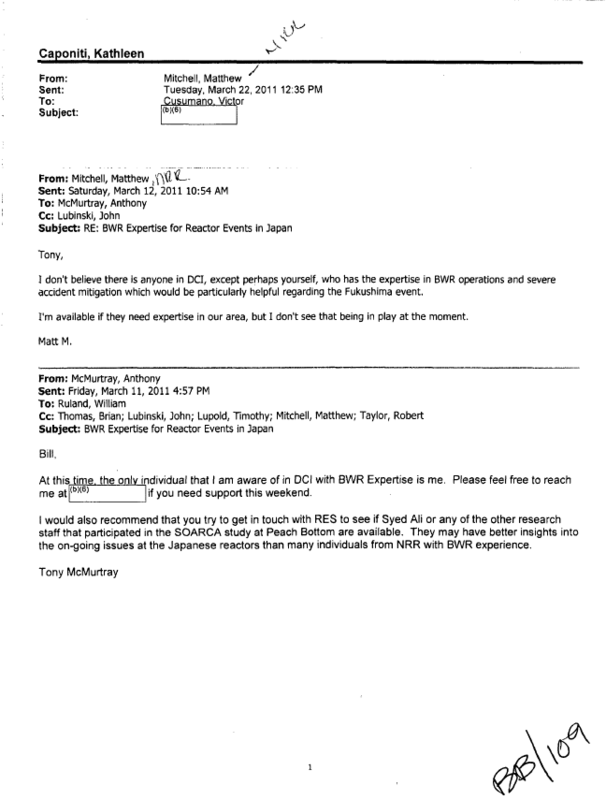 I don’t believe there is anyone in DCO, except perhaps yourself, who has the expertise in BWR operations and severe accident mitigation which would be particularly helpful regarding the Fukushima event. Im available if they need expertise in our area, but I don’t see that being in play at the moment. At this time. the onl individual that I am aware of in DCI with BWR Expertise is me. Please feel free to reach me atl (b)(6) if you need support this weekend. I would also recommend that you try to get in touch with RES to see if Syed Ali or any of the other research staff that participated in the SOARCA study at Peach Bottom are available. They may have better insights into the on-going issues at the Japanese reactors than many individuals from NRR with BWR experience.